Detectives Beyond Borders: Wow! I didn't know she could do that! Nothing in Hyzy's previous work and nothing I knew about her prepared me for her Manhattan Mayhem story, "White Rabbit," so today's question is What writers have surprised you in this way? What novels or stories have made you think, "Wow! I didn't know he (or she) could do that!"? 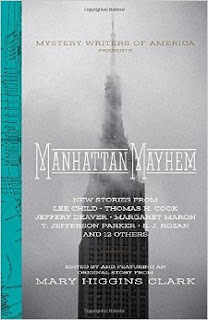 Manhattan Mayhem includes 17 short stories, and it ccelebrates the 70th anniversary of theMystery Writers of America, the organization that, among other things, presents the annual Edgar Awards. My other favorite in the collection so far is T. Jefferson Parker's "Me and Mikey," and the best title has to be S.J. Rozan's "Chin Yong-Yun Makes a Shiddach." The contributors include Jeffery Deaver. Lee Child, Margaret Maron, Thomas J. Cook, and more, a strong cast. I saw the title of your post and I thought, "You need to marry that girl." Then I read it and pulled my head out of the gutter. I realized the heading might be taken the wrong way as I started to type, but I would felt prudish changing it, you filthy old sod. I never imagined scoring a mention -- let alone such a wonderful review -- here on Detectives Beyond Borders. Woo-hoo! Thank you for taking the time to read "White Rabbit" and for your generous shout-out. This marks a career highlight for me! PS - The title of your post made me laugh. Love it! Julie, you are commendably broad-minded, if prone to occasional exaggeration. Career highlight? Tosh! Congratulations again on transcending your genre. Peter, Sheiler has told us over on Adrian's blog that you've got a mention in the L.A. Times Review related to Noir at the Bar. L.A. Review of Books. Yes, Jen Conley wrote the piece and was kind enough to ask me some questions beforehand. Thanks. Oddly enough, I am at the Baltimore train station now, returning from a Noir at the Bar. I got tp the train station early enough to exchange my ticket for one an earlier train, whose delay was announced right after I had paid $14 extra to make the change. I sent the link to the "Zens" this morning and now they are thinking that they may try and get to one of the L.A. ones. Which would be cool. I think Eric Beetner runs the ones in L.A. He's a good writer and a good moderator. And give my regards to the Zens.